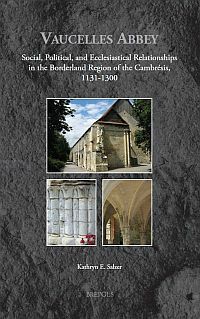 Kathryn Salzer provides an accomplished study of the early Cistercian monastery at Vaucelles in the diocese of Cambrai, a well-known abbey because its architecture may have inspired some of the drawings by Villard de Honnecourt and because it was an early daughter of Clairvaux. She presents the documentary evidence in light of some of the latest practices in charter analysis, which has begun to make distinctions between gift patrons or the actual donors or sellers, and authority patrons, those officials or their agents before whom a charter's transaction is declared and registered. Particularly for transactions on which she focuses, deriving from the cartulary covering the two granges not far from the abbey itself, her study witnesses the transformation in charter making from charters listing witnesses, to those issued by an authority and "fortified by that authority's seal." In this change, it was no longer necessary to recall witnesses to the fact of a transaction, because the sealed charter sealed by such an authority became dispositive - a legally binding document valid in its own right. 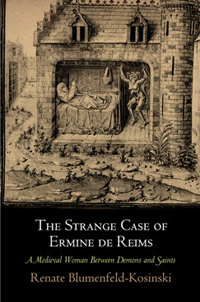 On the origins of such private charters, their use of signa or witnesses, the types of dating systems used, their formatting and their language, this is a model of an emerging practice, particularly within French studies of such charter evidence and good starting point, for any new student to the field. This is particularly so when supplemented by the study by Benoît-Michel Tock, Les chartes de l'abbaye cistercienne de Vaucelles au XIIe siècle (Turnhout 2010). The study appears to have begun with one of a cartulary for several of the abbey's granges. They are the historical context of a foundation within a region already budding with monastic foundations. What Salzer also makes so clear is that the contracts of conveyance all provide some measure of spiritual relief, even when it is not explicitly stated. Salzer's treatment makes clear the hierarchical aspects of land holding in long-settled areas such as this and the necessity for twelfth-century abbeys of Cistercian reformers to reckon with a social hierarchy in which land-holding rights are shared among various owners. They included dependent cultivators of various sorts, but also superior authorities such as feudal lords or owners of tithes or even counts or bishops. A thorough grounding in this social and political diversity adds to our understanding of the growth of an abbey from an early stage when it was wholly dependent on the goodwill of donors to one in which it had sufficient cash income to become an active purchaser of land. This is not a book primarily about spiritual life; Salzer nonetheless suggests that the liturgical life of Vaucelles was "a quiet voice in the background." Salzer has incorporated the latest trends in how she treats the charters by categorizing them by the identity of patrons - either as donors (gift patrons) who make original gifts or authority patrons who announce themselves at the opening of the charter as issuing a charter or making a confirmation for that gift patron and affirm it by attaching a personal seal to the parchment. Describing some of the inevitable biases of narrative texts (chronicles and gesta and saints' lives and even statutes of the Cistercian Order), Salzer suggests that a close identification between the abbey and Bernard of Clairvaux as father-visitor in the foundation narrative from the 1180s was probably because Bernard had recently been canonized. Certainly in the recent edition of its earliest charters by Tock, there is no reference to Bernard of Clairvaux. I have only a couple of quibbles. First, I would question Salzer's insistence that Vaucelles be treated within the context of borderland studies like those of Jamroziak or Oram. She makes a fine argument for the region as a conflict zone among various political and ecclesiastical authorities, but she also shows that this is not a "frontier society" like those of Ireland, northern Britain or the Baltic. None of the latter had ever seen Roman settlement or agriculture or Christianity before. She reads the charters with a care that allows her to assert that those monks were acquiring land already under cultivation. Those monks, except when they reached the polder lands of the seacoasts were not living on an economic and social frontier, but only, perhaps, a political one. Indeed, she underlines early charters that describe land already under cultivation and shows that in instances where they were given land to bring under cultivation, they apparently failed to do so. Indeed, the region of Cambrai about which she writes, despite its political complications, was part of an old Europe. The Cistercians' relationship to the land was primarily as managers and not as pioneers. Similarly Salzer's study traces the introduction of ordo cisterciensis terminology in tables 7 and 8, beginning on page 264; her arguments for the Cistercian references in documents from 1165 forward is impeccable in my view. But that is not true for the single earlier reference to Cistercian practice, found in what has been seen as a foundation document bearing the date 1132/33 (although found only in an 1180s copy). This in fact must be seen as an acte-notice as is suggested by Tock on page 31 of his introduction to the charters and provides considerable evidence that this document contains a mixture of language and style from two different scriptoria, the style of Cambrai's episcopal scribes and that of Vaucelles' monastic scriptorium. The same may be true with regard to the dependence on the Gallia Christiana, which reports for mid thirteenth century 140 monks and 300 lay-brothers. This is quite puzzling for a time generally viewed as one in which the recruitment of both monks and lay brothers was declining. More likely these are cumulative numbers for an entire century, as is suggested by the Vaucelles foundation narrative which lists all who had entered under the first abbot as monks or as lay-brothers (although it is clear from that list that some of them had died) and as reported by Salzer for 1151. Her Table One p. 121 lists "107 monks cumulative" and "126 lay-brothers cumulative" for 1151. Such reticence by Salzer and Tock on this point may well be in deference to earlier, but still-living scholars. Salzer's approach is neither naive nor foolhardy, and her work manages to avoid many of the pitfalls of recent Cistercian historiography. That the Vaucelles charters make no reference to Bernard of Clairvaux until the foundation narrative of the 1180s (as Salzer notes), and that they make no reference to the Cistercians until a charter from 1165 (as suggested by Tock) suggests that future researchers may still raise the question of how Vaucelles came to become such a favored daughter of Clairvaux. Benoît-Michel Tock: Foulques de Cambrai, La Foundation de l'abbaye de Vaucelles, Paris 2016.